Gambian President Yahya Jammeh has said he will not step down before a Supreme Court decision on disputed elections, a ruling now not expected until May. In a nationwide TV broadcast, the longstanding ruler also reiterated his concern at "foreign interference". Regional mediators, led by Nigeria's president, are expected in The Gambia on Friday to urge him to accept defeat following December's election. President-elect Adama Barrow says he will be inaugurated next week. Mr Jammeh, who initially accepted defeat in the 1 December poll, lodged a case before the Supreme Court after the electoral commission changed some results. But the commission insists the outcome was not affected by an initial error and property developer Mr Barrow narrowly won. The president made his speech on Tuesday evening after it was announced that the Supreme Court hearing would be delayed until May because of a shortage of judges, who mostly come from neighbouring countries. The chief justice suggested mediation would be the best way forward as Nigerian President Muhammadu Buhari and other West African leaders head to the country in another attempt to end the deadlock. But Mr Jammeh said his cabinet and the National Assembly would remain in place "to ensure the rule of law is upheld" pending the court's ruling. "[Under the constitution], only the Supreme Court can review our challenge and only the Supreme Court can declare anyone president," he said. The president lashed out at the UN, the African Union and the West African regional body Ecowas for their "hasty resolutions" given the peaceful nature of the dispute so far. "Our review and investigation have revealed an unprecedented level of foreign interference in our elections and internal affairs. And also, a sustained smear campaign, propaganda and misinformation," he said. 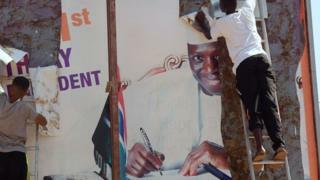 The Gambia would not allow any organisation, treaty or law to supersede its constitution, he added. The 51-year-old leader also appointed a national mediator to meet "all parties to resolve any mistrust and issues" and draft an amnesty bill to ensure there was "no witch-hunt so that we can restore a climate of confidence and security". The Gambia, a popular tourist destination, has not had a smooth transfer of power since independence from Britain in 1965. Results were revised by the electoral commission on 5 December, when it emerged that the ballots for one area had been added incorrectly.